Ocean walk in Lahaina Town. In a nutshell: An oddly eclectic mix of history, restaurants, T-shirt shops, fine art galleries and gold-by-the-foot, Lahaina is the quintessential “old-time-sea-town-turned-tourism” with a uniquely Maui twist. The second most visited spot in Maui, Lahaina is compact and crowded. 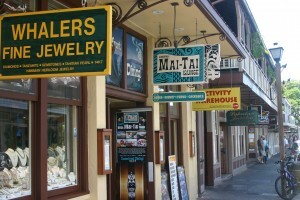 It is also the only full-featured, walkable “down-town” you’ll find on Maui. On the surface, Lahaina will be a place not dissimilar to a popular ocean town closer to home. But under the surface of bars and trinket shops, Lahaina reveals a uniqueness not duplicated anywhere else. Stores, stores and more stores. The number-one attraction in Lahaina is definitely “the buzz.” Great restaurants, hoppin’ night-life, swingin’ bars – and shops featuring wares ranging form “made-in-China” trinkets to exquisite local hand crafts; from cheap jewelery to masterpieces of fine art. For those quick to point toward commercialism as causing a loss of authenticity in this historic area, the irony would be that they’re overlooking one important fact: shopping, eating, drinking and merriment have long been a central part of Lahaina Town. Love it or hate it, the frenzy of activity is aligned with history; Lahaina has been “buzzing” since well before tourism ever washed up on these shores. While “the buzz” could fit into most any of your run-of-the-mill tourist towns, the over 40 fine art galleries in Lahaina are definitely a “uniquely Lahaina” touch. In fact, fine art anchors this town to a level of sophistication that would probably otherwise be lacking. While you’ll definitely find plenty of galleries that feature the works of local artists, and plenty of opportunities to view and purchase tropical and ocean genre-specific artwork, these are by no means the limit of the range of art offered. 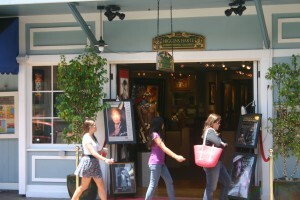 There are many well known galleries in Lahaina with branches in cosmopolitan locations across the world, and several world-renowned artists also have their own dedicated galleries on Front Street. With styles ranging from the marine life depictions of Wyland to the psychedelia of Peter Max – Lahaina is unquestionably a player on the world-stage when it comes to the exhibition and sale of fine art. On Friday evenings between 7-10pm the galleries offer “Art Night.” Many galleries offer special events, including featuring artists in person. So if you have an interest in art – this is a great time to stroll and catch a chance to chat with some of the artists. A view of the docking area in Lahaina. Lahaina is also home to the primary harbor in West Maui, and is where the majority of West Maui fishing, snorkeling and whale watching tours depart. Cruise ships ferry passengers for day-trips from their anchor further out in deeper water and this is also where the Moloka’i and Lana’i ferries depart. Note: If you aren’t staying in West Maui (or using one of the ferries), Ma’alaea Harbor (and Kihei Boat Ramp) are usually better choices. Okay, I’m mystified with the overwhelming consensus of the commercial guidebooks on this topic: unless you’re obsessed with free parking, parking complaints are waaaaay exaggerated and overdone. In fact, I’m not exactly sure what planet these guys are from calling it difficult to park. The bottom line is, that unless you’re too cheap to pay $5-10 to put the car in a parking lot, your only parking difficulty will likely be in choosing which of the over fifteen lots in just a few square blocks to park in. My advice is to not even bother looking for a free parking spot. If you decide to attempt to scout out a free spot anyway, you can likely expect not to find one for a while (experiencing the joy of Lahaina congestion in the process.) When you find your coveted spot, you’ll discover there is a time limit – between 30-minutes and three hours. If you push it a nanosecond past the time limit, you’ll also discover how on-the-ball enforcement is, and that the parking ticket costs a whole lot more than the lot would have. Now, if we want to start complaining, lets talk about driving to, through or around Lahaina. If there is an accident, or a big event, that, my friends, can be an absolute nightmare worthy of full-tilt road rage. Under the already uniquely eclectic surface, Lahaina also has an equally rich and varied history. It is best known for its role as a significant Pacific whaling port. But whaling is only a small slice of Lahana’s history. Lahaina has been central to key western-introduced industries such as whaling, pineapple and sugar. Lahaina has also been a place where immigrants landed; a place with ancient sacred grounds; a capital of a united Hawai’i; and a place where missionaries came to impose their ideals on a native people and visiting sailors with equal fervor. Lahaina has literally been everything from a place of battle, destruction and tragedy, to a place of royalty, celebration and pleasure. Few visitors come to Lahaina for anything but what is right on the surface, and the majority of the cultural and historical value here has not yet been presented in a way that engages those not looking for it. The result is that unless you seek it out, the history here beyond building facades and plaques ends up being barely perceptible to most. But that does not mean history and culture aren’t right there, waiting to be coaxed out – because they are. But what it does mean is that if experiencing these things is what you’re after, you’re likely going to have to set out to find them. The easiest way for visitors to get a genuine balanced idea of what cultural richness lies below the bohemian surface is to contact Maui Nei and get in on one of their guided Lahaina tours. These folks are also closely affiliated with the restoration of Moku’ula – one of the most important cultural sites in Hawaii, whose restoration has just begun. I believe once restored, Moku’ula will write another chapter in Lahaina history, and become a significant draw in its own right. Maui Nei tours of Lahaina cost $39/Adults; $25/Kids 12-17 and proceeds go to the foundation. 808-661-9494. You can also visit the Lahaina Restoration Foundation “Historical Sites” page. I’ve linked appropriate items below. The Friends of Moku’ula website site has a small set of archives available on specific sites as well. An Ahupua’a is a method of land division used by the pre-contact Hawaiians who were keenly aware of the interconnection and reliance of the various parts of the watershed. They divided land in pie-slice-like divisions from the top of the mountain to the sea, and each slice is called an Ahupua’a. The Waine’e Ahupua’a was historically the seat of the Ali’i (royalty) in Lahaina and contains important pre-contact cultural treasures, most notably Moku’ula. Called Rotten Row for the shifty practices of the day, this place marks where one specific part of canal was built and a marketplace stood where trading was done between citizens and ships. It should be noted that dating from pre-contact times there were also a substantial canals inland which were both used to deliver water to the Lahaina area, and also later used for transportation to the marketplace. The canal was filled in around the same time as Moku’ula. Lele was the Hawaiian pre-contact name for Lahaina. Lahaina was where Maui had contact with the outside world. This is the minimally reconstructed corner of the Old Fort which dominated Lahaina Town from 1832 to 1854. It was constructed of coral blocks and sand, and at one time had 47 canons (salvaged from sunken vessels) atop its walls. Its primary use was actually as a prison, but it was also used (more for show) to protect missionaries homes from ship canon fire. Another interesting tidbit is that it has been said to have been used at dusk where a Hawaiian sentinel would “beat a drum furiously” to alert all ashore that they must return to their ships. Directly between the banyan tree and Lahaina Harbor, the Old Lahaina Courthouse was originally built in 1859 from salvaged materials taken from the palace of Kamehameha II. 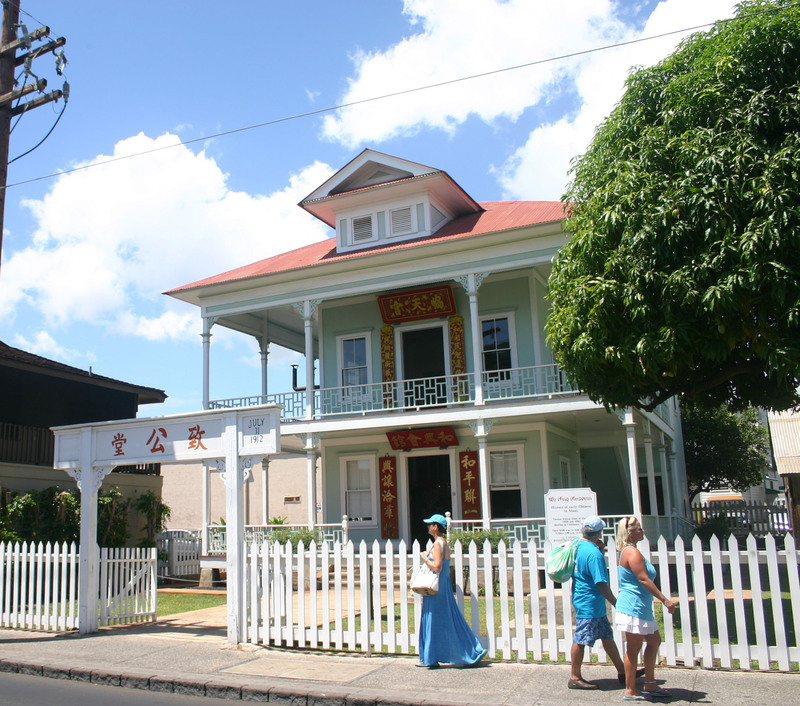 Current tenants include the Lahaina Heritage Museum and the Lahaina Arts Society. There is also a visitor’s center and public restrooms. 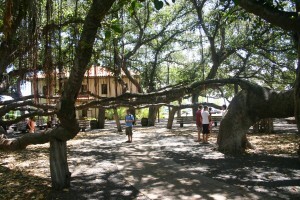 Part of the giant Lahaina banyan tree, with the Old Courthouse in background. Probably the most famous landmark in Lahaina – the Banyan Tree was planted in 1873 by the Sheriff to commemorate the 50th anniversary of the first Mission. The tree was brought from India, and was only 8′ high at the time of planting. It now has a dozen main trunks, and spreads over the better part of an acre. Just North of the Banyan Tree this building was constructed in 1901 by George Freeland to house and entertain visiting sailors. It is now a Best Western and casual restaurant. The great grandson of George Freeland (who shares the same name) is also the president of the Lahaina Restoration Foundation. Now just a marker, this indicates where William Richards’ house stood. Richards was the first Protestant missionary to Lahaina. After his missionary work, Richards left to work directly for King Kamehameha III as teacher, chaplain and translator. He later assisted in drawing up the constitution and traveled abroad as the King’s Envoy. Quite unfortunately filled in years ago, this is the site of where King Kamehameha’s taro patch once was. Kamehameha worked on the Taro patch himself to teach his subjects the dignity of labor. Hopefully one day part of this this will be restored. 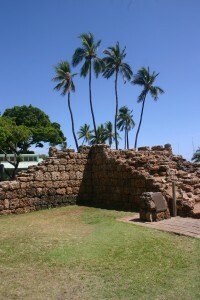 Only remnants and a marker remain – this was a simple structure built of brick in 1802 by Kamehameha I to welcome sailors. It is said to be the first western-style structure in Hawaii. At the ocean in front of the Lahaina Library, this stone in the shape of a chair (look for the brass marker) and was believed to have healing properties by the ancient Hawaiians. Ali’i (royalty) are also said to have given birth on this stone. Many of these above (and other un-noted) sites center around the days of the Pioneer Mill and WWII, both of which permeate Lahiana, and Maui. Plaques at each of these stops provide short bits of information on these less popular sites of historical value. The buildings are not generally open to tourists (but grounds are.) If you can get inside, there are stunning Buddhist works of art adorning the walls and ceiling. The grounds are home to what is often claimed to be “the largest Buddha statue outside of Japan.” It is definitely impressive and beautiful (and big) – but biggest outside of Japan?!? I mean, come on – there are Buddhas in many parts of the world that would dwarf this – clearly some other qualifications were lost playing “whisper down the lane” on this one. The cousin of Herman Melleville rests here, as well as other seamen. The LRS web page description for this one says it all. Behind the distinctive temple facade actually stands a standard plantation-style building. This is, just as the name suggests, a Buddhist temple of the (Japanese) Shingnon Sect. Born on the big Island in the ealy 1790’s, Malo is a renowned Hawaiian scholar and philosopher who relayed much of what we know today of old Hawaii, traditions and Hula. Malo spent only a small, but critical portion of his life in Lahaina. At around 30 years old, Malo came to Lahaina to be educated at the first school in Hawaii (Lahainaluna) and was also converted to Christianity (where he took the name “David’.) Malo then moved to East Maui for his remaining years. Lahainaluna school (claimed to be the oldest school west of the Rockies) still celebrates Malo every year. I believe the LRS sign is incorrect, as I understand it (and according to the church) the name of the cemetery did not change with the name of the church. Several members of Hawaiian Ali’i are buried here, including King Kaumualii (the last king of Kauai), Queen Kekauonohi (Kamehameha II) and Princess Nahienaena (sister of Kamehameha II and III). Once a sacred island inside an 11-acre pond, this site is one of the most important pre-contact archeological finds and restorations in all of Hawaii. This site is currently in the long process of restoration, but when completed promises to be one of the keystone historical sights in Lahaina. I am eagerly awaiting its restoration. The Friends of Moku’ula website has lots of great information, and every visitor should consider donating to the cause. Just nine feet tall when it was originally built in 1840, the lighthouse now towers at a more respectable 55′. The LRF website does a fair job describing the many incarnations of this historic lighthouse over the years. Mile Marker: #20-22 between Honoapi’ilani Hwy (aka Hwy 30) & the ocean. Thx for all the helpful positive comments! I am planning on coming in NCL – Pride of America Sunday & Monday in April. 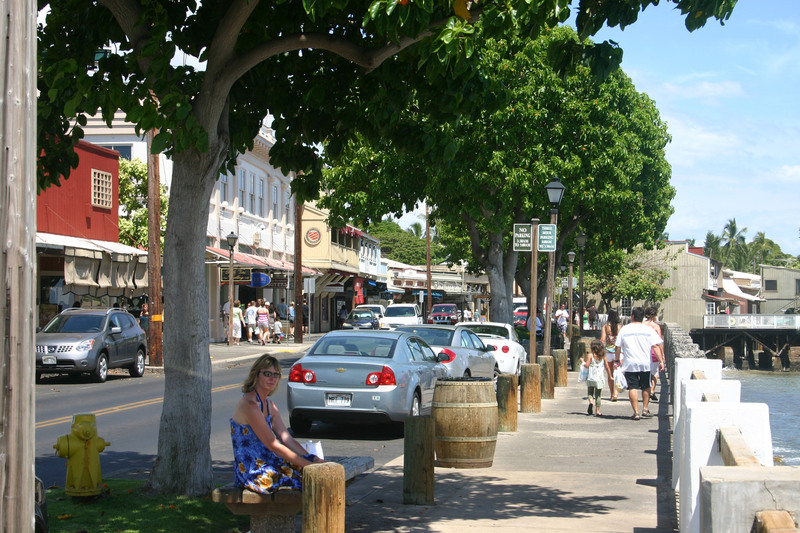 Is it better to tour Lahaina Town on Monday when everyone is at work and school or on Sunday? Lahaina is a tourist-driven town, so there is really no noticeable difference in what day of the week it is for traffic. Have fun! Thanks Mark – Can you please tell me what the normal business hours on the stores are M-F so I can plan my arrival and departure times? Sundays are a little quieter. 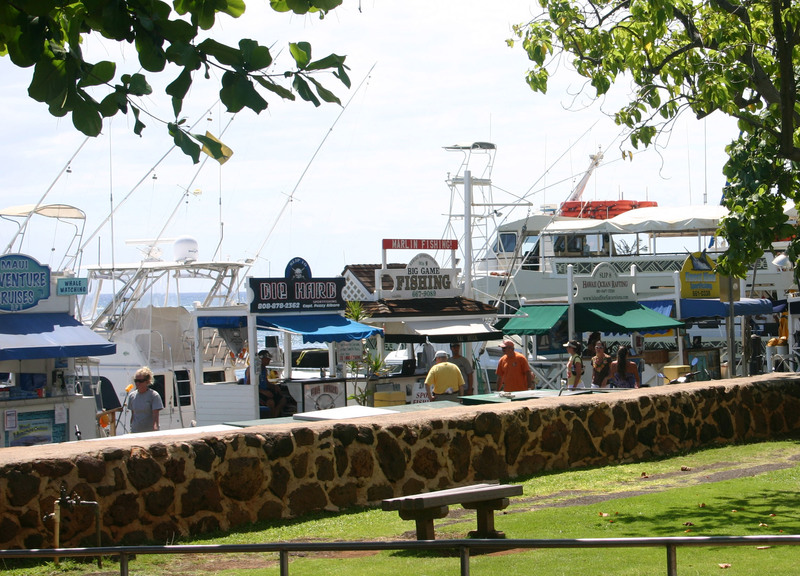 Some cruisers come on Sunday and come back to Lahaina town again on Monday. 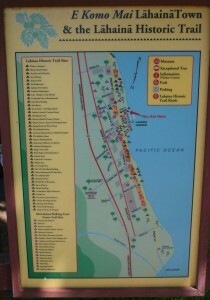 Please note the whole west side is part of Lahaina. The historic district has the views, history, shopping and oceanfront dining. Whalers Village is a shopping center (not a village)that is 15 minutes drive from the historic district.! It is under reconstruction. Just wanted to express my frustration and disappointment about what happened to me today. Spent the morning surfing in Lahaina with my family. Great people, nice time, and then when about to leave we were looking for other parking spots, and none at all!!! Nothing. So we thought about leaving to g somewhere else and then decided to stay to have lunch and do some shopping. A couple of hours after, and a good $300 of local activities, we were very pleased to have a nice gift on out windshield with a $60 parking fine for overtime. Great way to welcome tourism. Not only there are not enough parking spots but when you obviously decide to spend time and money with locals, you have also to pay the township for parking fine. This is the last time you see me in your town. We have a trip planned for next week. My Hubby & I want to get tattoos we will be in Lahania 4 nights. Any recommendations? I don’t think so, but try posting on the We Grew Up On Maui Facebook page – someone may have info or photos. Good luck! Can anyone tell me when and where the International Festival Of canoes is . Thanks . I am coming to Maui and would love to be there for that . I found your description of Lahaina to be honest, interesting, humorous and most of it correct. Except for “shopping”, I agree that Lahaina has a long history of “eating, drinking and merriment” along with a “history rich in battle, destruction and tragedy” and “a place of royalty, celebration and pleasure.” Your description is close to this ‘local’s’ perspective. I encourage you to update your information to include the fact that High Chiefess Keopuolani is laid to rest at Waiola Cemetary. It is an honor to have this distinction because she was Queen to King Kamehameha and the first Hawaiian to be baptized in the Christian faith. Further information is available at waiolachurch.org. Does anyone know the name of the store that sells Bikini Blonde tee shirts? I want to order one from them and I need their name. Aloha, just if you feel to have crepes, great sandwiches or internet: Maui Swiss Cafe at 640 Front Street. Just look for the famous pink umbrellas and the flintstone car! See you there! Love this write up so much we blogged it! @Kris – Yup, learned parking the hard way. I like your take on the free parking. I don’t think we’ve ever bothered with free parking, and as long as you plan your day right and take advantage for whatever amount of time you pay for, it’s a good deal. We absolutely love walking up and down Front Street, from the Old Lahaina Center all the way to the Pacific Whale Foundation store at the other end. One thing we still haven’t done yet, regrettably, is the Lahaina Historic Trail you posted about. Next chance I get, I really want to take a photo walk of as much of that as possible. Keep up the great work with this guidebook. Wow, what research! Makes me think you may have stumbled around these parts late on a long weekend, looking for pirate loot or abandoned ice cream cones.